The process of becoming an Ig-producing plasma cell takes the mature B cell through the germinal center, where Ig genes are diversified through somatic hypermutation and class switch recombination. To more clearly define functional characteristics of the germinal center dark zone centroblasts and the light zone centrocytes, we have performed expression analysis of the CD77+ and CD77− populations, because CD77 has been accepted as a discriminator of centroblasts and centrocytes. Our results demonstrated that the CD77+ and the CD77− populations lack functional associated expression programs discriminating the two populations. Both populations are shown to be actively cycling and to share common features associated with cell cycle regulation and DNA maintenance. They are also shown to have an equally active DNA repair program, as well as components involved in somatic hypermutation and class switch recombination. Moreover, the data also demonstrated that the CD77− population comprises cells with an already initiated plasma cell differentiation program. Together this demonstrates that CD77 does not discriminate centroblasts and centrocytes and that the CD77− population represents a heterogeneous subset of cells, comprising centroblasts, centrocytes, and plasmablast. The germinal center (GC)3 constitutes an imperative functional niche in the adaptive immune system, where B cell Ig genes are diversified through somatic hypermutation (SHM) and class switch recombination (CSR) processes. These events lead to the formation of high-affinity Abs that will facilitate eradication of invading pathogens. The current classification of different stages in human mature B cell differentiation starts with naive B cells that turn into centroblasts and centrocytes, within the GC. These GC B cells subsequently differentiate into memory cells or plasma cells, the latter actively secreting Ag-specific Igs. The most comprehensive classification of the mature B cell subsets was made already in 1994 (1, 2, 3), based on the expression of phenotypic markers, such as CD38, IgD, IgM, CD23, CD77, and Ki67, as well as on the presence of mutations in the variable Ig genes and the expression of sterile Iγ, Iα, and Iε transcripts. Thus, naive B cells were defined as IgD+/CD38− B cells, having recombined Ig genes. A ligand-selected subpopulation of the naive B cells was further defined, on the basis of the low-affinity IgE receptor (CD23) expression (1). The GC B cell subsets were the IgD−/CD38+/CD77+ cells, engaged in the SHM process (2), and the IgD−/CD38+/CD77− cells involved in the CSR process (3). It was thus suggested that centroblasts were CD77+, whereas the centrocytes had lost CD77. The IgD−/CD38− subset was defined as memory cells, whereas plasma cells were defined as IgD−/CD38++. In previous studies (4, 5), we and others have observed that the CD77+ and the CD77− populations display only minor differences in their expression programs. We have now further analyzed the transcriptional profile of the different purified B cell subsets, defined by Liu et al. (1, 2, 3), and to functionally discriminate the two GC B cell subsets we have now focused on the regulation of specific programs associated with proliferation, SHM, and CSR. In contrast to previous studies (4, 5), we have based our conclusion on transcriptional analysis, using a gene chip covering 22,283 probes, including both genes and expressed sequence tags. The global expression profile of all these probes demonstrated that several thousand genes differed between GC and the non-GC B cell subsets, whereas the GC CD77+ and CD77− subsets again only showed minor transcriptional differences. The transcriptional profile of the GC B cells demonstrated that not only the CD77+ cells, but also the CD77− cells are proliferating, which was also validated by cell cycle analysis. The transcriptional analysis further shows that both GC subsets have an equally active program for SHM and CSR, as exemplified by the expression of activation-induced cytidine deaminase (AID), uracil-DNA glycosylase (UNG), and several other genes implicated in these processes. Analysis of the synthesis pathway of CD77 suggests that the only true difference between CD77+ and CD77− GC B cell seems to reside in the expression of the B3GALT3 enzyme, which is the enzyme converting CD77 to the P Ag. Moreover, the results also demonstrated that the plasma cell differentiation program is initiated already in cells included in the CD77− population. All in all, these findings demonstrate that the current classification of the GC B cells clearly calls for a reclassification, because CD77 is not a discriminator of centroblasts vs centrocytes. Anti-IgD FITC, anti-IgD PE, anti-CD3 PE, and anti-CD3 PECy5 were obtained from DakoCytomation. Purified anti-CD38, anti-IgD, anti-CD3 FITC, anti-CD3 PacificBlue, anti-CD14 PacificBlue, anti-CD23 PE, anti-CD38 PECy5, anti-CD38 PECy7, rabbit anti-mouse IgM PE, and rat IgM Abs were purchased from BD Biosciences. Anti-CD77 (38.13) and goat anti-rat IgM PE Abs were purchased from Beckman Coulter and Serotec, respectively. Abs to P Ag (AME-2) were a gift from I. de Jong (Sanquin, Amsterdam, The Netherlands). The anti-CD77 (5B5) Ab was provided by M. Nahm (University of Alabama, Birmingham, AL), and the anti-CD77 (6A2) Ab was derived from hybridoma 424/6A2, which was a gift from P. Björk (Active Biotech Research, Lund, Sweden). Human tonsils were obtained from pediatric patients undergoing routine tonsillectomy at the Lund University Hospital or Malmö Academic Hospital. Briefly, tonsils were minced and T cells were removed by rosetting with neuraminidase-treated SRBC. Mononuclear, T cell-depleted cells were isolated by density centrifugation, using Ficoll-Isopaque (Amersham Biosciences). The interphase fraction, containing predominantly B cells, was washed in PBS containing FBS (10%). To enrich for naive, GC, or memory B cells, the interphase fraction was subjected to negative selection by incubating with precoated anti-CD38, anti-IgD Dynabeads (sheep anti-mouse IgG or pan mouse IgG; Dynal Biotech) for 45 min on ice. Cells depleted for CD38 were stained with anti-CD38 PECy5, anti-CD3 PECy5, anti-IgD FITC, and anti-CD77 Abs, followed by goat anti-rat PE Abs. Cells depleted for IgD were stained with anti-CD38 PECy5, anti-IgD FITC, anti-CD3 FITC, and anti-CD23 PE Abs. Cells depleted for both CD38 and IgD were stained with anti-CD38 PECy5, anti-IgD FITC, and anti-CD3 PE. All depleted cell fractions were then positively selected by flow cytometric cell sorting, using a FACSVantage SE (BD Biosciences), as follows: 1) IgD+/CD23−/CD38−/CD3−; 2) IgD+/CD23+/CD38−/CD3−; 3) IgD−/CD38+/CD77+/CD3−; 4) IgD−CD38+/CD77−/CD3−; and 5) IgD−/CD38−/CD3−. These subsets were >98% pure, as defined by their phenotypic descriptions. Isotype-matched control rat IgM Ab was used to evaluate the unspecific contribution, showing <0.2% of the cells falling within the CD77 sorting gate. Freshly isolated cells were lysed in TRIzol (Invitrogen Life Technologies). The RNA was extracted from the cell lysate by adding 0.2 vol of chloroform. The aqueous phase containing the RNA was separated and subsequently precipitated with isopropanol and washed in 75% ethanol. The RNA pellet was dissolved in diethyl pyrocarbonate-H2O and further purified with the RNeasy Mini Kit (Qiagen). The total RNA content was assessed by spectroscopy at 260/280 nm (GeneQuant II; Pharmacia Biotech). After a second precipitation step in 2.5 vol of ethanol and subsequent wash, the RNA was resuspended in diethyl pyrocarbonate-H2O. Five micrograms of total RNA was used for the cDNA and cRNA synthesis, as previously described (4). A hybridization mixture was prepared with the biotinylated and fragmented cRNA at 50 μg/ml, as described previously (4), and hybridized onto a U133A microarray (Affymetrix). The probe array was then stained with a solution of 2 mg/ml acetylated BSA and 10 μg/ml streptavidin R-PE (Molecular Probes). A secondary amplification stain was performed with acetylated BSA, normal goat IgG (Sigma-Aldrich), and biotinylated goat anti-streptavidin Ab (Vector Laboratories). A final staining step with streptavidin R-PE was performed before the probe arrays were scanned in the Gene Array Scanner and checked using the Micro Array Suite 5.0 (Affymetrix), as described previously (4). The dataset was analyzed in Micro Array Suite 5.0, Bioconductor (〈www.bioconductor.org〉) and Gene Spring (Agilent Technologies). The signal intensity values were analyzed as nonscaled, background corrected, quantile normalized (6), and robust multiarray averaged measures, as defined by Irizarry et al. (7). They were further linearized and correlated to the gene distribution median to achieve better intergene comparability. Filtering and expression pattern analysis were performed in Gene Spring. The dataset was annotated based on HGNC (〈www.gene.ucl.ac.uk/nomenclature〉) and Unigene (〈www.ncbi.nlm.nih.gov/UniGene/Hs.Home.html〉). T cell-depleted mononuclear tonsil cells were stained with anti-IgD FITC, anti-CD38 PECy5, and anti-CD77 (38.13), followed by goat anti-rat IgM PE Abs, or anti-CD77 (5B5), or anti-CD77 (6A2), followed by rat anti-mouse IgM PE Abs. CD77+ and CD77− cells were sorted, as previously defined; memory cells were used as reference. Two million cells of each population were collected. Each population was fixed in cold 70% ethanol for 30 min at 4°C, washed twice in cold PBS, and treated with RNase A (Sigma-Aldrich) at 100 μg/ml, followed by propidium iodide (Sigma-Aldrich) at 50 μg/ml just before analysis. Sorting and analysis were performed on a FACSAria (BD Biosciences). Cryostat sections (8 μm) of tonsil were stained with anti-CD77 (38.13) (Beckman Coulter) or a rat IgM isotype-matched control (BD Biosciences) in PBS at 4°C overnight. After extensive washing in PBS, the tissue sections were incubated with a secondary goat anti-rat IgM PE Ab (Serotec) for 60 min at 4°C. A ScanArray Express HT confocal laser scanner (PerkinElmer) equipped with a 488-nm laser was used for imaging. Image analysis was performed with the Quantity One software (Bio-Rad). Air-dried cytospin preparations of sorted fractions of naive, CD77+, and CD77− tonsillar B cells were stained in May-Grunwald eosin (Histolab Products) for 5 min, washed in distilled water, and stained in Giemsa stain (Histolab Products) for 20 min. Dried preparations were analyzed in light microscopy. The distribution of CD77 within the GC has been shown to be highly dependent on the Ab clone of choice, and the conclusions as to whether CD77 is a dark zone/centroblast marker or not are diverging (8, 9, 10). To reassess the distribution of CD77 within the GC, we stained tissue sections from tonsils for CD77 with the CD77 clone 38.13, used in previous tissue stainings (9). The analysis demonstrated that CD77 is evenly distributed in the smaller GCs, whereas the larger GCs display a gradual decrease of CD77 going from the dark zone to the light zone (Fig. 1⇓). Thus, in line with previous studies (9), CD77+ cells are enriched in the dark zone of the GC, indicating an association to the centroblasts. However, whether all centroblasts are CD77+ is not disclosed by this analysis, implying that the centroblast population may comprise cells also lacking CD77. To further characterize the nature of CD77+ and CD77− GC B cells, we analyzed the transcriptional regulation of these two populations in greater detail by gene expression profiling. A, Cryostat section of tonsil stained with anti-CD77 (38.13) demonstrating the distribution of CD77 within the GC. Numbers (1–18) indicate sample points for image analysis in B. B, Quantification of the CD77 distribution within GC structures in tonsil showing the average intensity (y-axis) for each sample point selected in A. This analysis demonstrated that CD77 is equally distributed in smaller GC structures, whereas larger structures show a gradual decrease in CD77 across the GC. 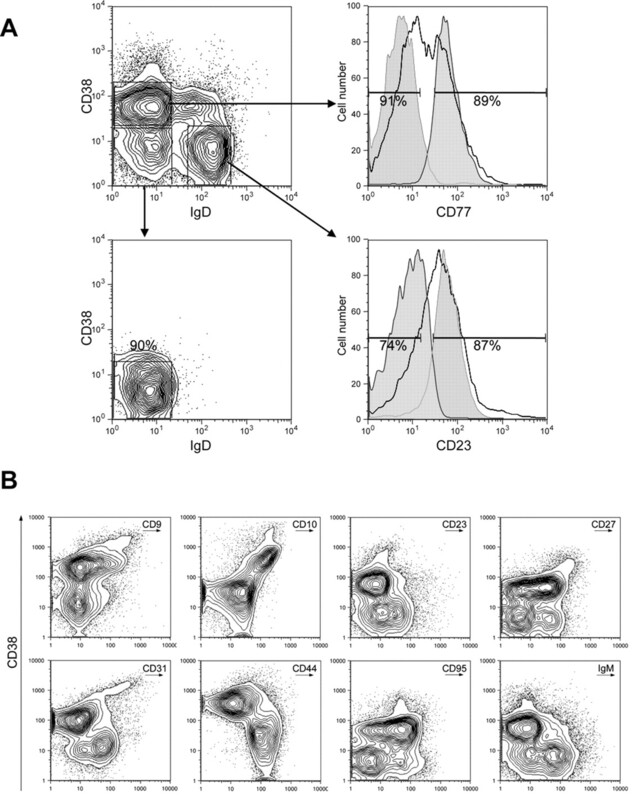 Five different subpopulations of tonsillar B cells were isolated by fluorescence-activated cell sorting and categorized as follows: 1) IgD+/CD23−/CD38−/CD3−; 2) IgD+/CD23+/CD38−/CD3−; 3) IgD−/CD38+/CD77+/CD3−; 4) IgD−/CD38+/CD77−/CD3−; and 5) IgD−/CD38−/CD3− (Fig. 2⇓A), previously defined as naive, ligand-selected, centroblast, centrocyte, and memory cell populations, respectively (1, 2, 3). Labeled cRNA from all subsets was hybridized to Affymetrix U133A arrays and scanned on a confocal laser scanner. A, The five mature B cell populations were sorted according to the model by Pascual et al. (2 ) at a purity typically of 90% of the original sortgate. Lower right panel, Total CD23 distribution of the CD38−/IgD+ population (black line), sorted CD38−/IgD+/CD23− subset, and CD38−/IgD+/CD23+ subset (shaded areas); filled bar, indicates original sort gate and beneath the sort purity in percentages. Upper right panel, Total CD77 distribution of the CD38+/IgD− population (black line), sorted CD38+/IgD−/CD77+ subset, and sorted CD38+/IgD−/CD77− subset (shaded areas); filled bar, indicates original sort gate and beneath the sort purity in percentages. Lower left panel, Sorted CD38−/IgD− subset; square box, indicates original sort gate and above the sort purity in percentages. B, The transcriptional expression pattern corresponds well with protein expression, as validated by flow cytometry for several surface-expressed proteins represented by CD9, CD10, CD23, CD27, CD31, CD44, CD95, IgM (x-axis), and CD38 (y-axis). The onset of CD38 presents a distinct change in the transcriptional program, which is evident, both at the transcript and protein level. The general behavior of the data was evaluated by correlation analysis, and the data set displayed very high r values of 0.99, 0.98, 0.98, 0.99, and 0.95 between replicates for the five populations, respectively (Fig. 3⇓A); Fig. 3⇓B also displays the overall gene expression profile of the five populations. To validate the GeneChip analysis, we analyzed the regulation of known GC and B cell markers (Fig. 2⇑B). Thus, CD23 (FCER2), CD31 (PECAM), CD44, and IgM (IGHM) were typically absent in the GC B cell subsets, whereas CD9, CD10 (MME), CD27 (TNFRSF7), and CD95 (TNFRSF6) were present (Figs. 2⇑B and 4⇓A). As expected, B cell line (BCL)6 was found to be typically linked to GC B cell subsets accompanied by a strong down-regulation of BCL2 (Fig. 4⇓A). Also, AID (AICDA), central in both SHM and CSR, displayed a strong association to both GC B cell subsets. A, The behavior of the data set was evaluated by Pearson correlation of replicate 1 (x-axis) vs replicate 2 (y-axis) for the following: 1, IgD+/CD23−/CD38−/CD3−; 2, IgD+/CD23+/CD38−/CD3−; 3, IgD−/CD38+/CD77+/CD3−; 4, IgD−/CD38+/CD77−/CD3−; and 5, IgD−/CD38−/CD3− sorted populations. The plots display normalized and background corrected robust multiarray averaged measures. The r values within each respective scatter plot show that the correlation coefficient was typically very high between replicates. B, Line graph representing the mean relative expressional change (y-axis) of all 22,283 genes and expressed sequence tags across all populations, 1–5 (x-axis). Genes up-regulated in the GC are colored red; genes down-regulated in the GC are colored green. The general transcription pattern demonstrates a profound change in the transcriptional program for the GC subsets. This transcription program is prevailing, displaying no distinctive difference between the two GC B cell subsets. Heat map representation of expression measures for B cell control genes (A), plasma cell signature (B), cell cycle (C), and DNA maintenance and checkpoint control (D) for the following: 1, IgD+/CD23−/CD38−/CD3−; 2, IgD+/CD23+/CD38−/CD3−; 3, IgD−/CD38+/CD77+/CD3−; 4, IgD−/CD38+/CD77−/CD3−; and 5, IgD−/CD38−/CD3− sorted populations. Color range from >2-fold up-regulated (red) to >2-fold down-regulated (green) expression relative to the mean relative intensity for each gene. Genes are ordered based on a functional relationship within each group. The transcriptional regulation of cell cycle regulators outlines the proliferative status of the different B cell populations. In the non-GC subsets, the G1 regulators cyclin D1 (CCND1) and D2 (CCND2) were predominant (Fig. 4⇑C). Unexpectedly, both the proliferating CD77+ as well as the alleged nonproliferating CD77− expressed genes involved in an active cell division program (Fig. 4⇑C). Genes, including cyclin D3 (CCND3), E1 (CCNE1), E2 (CCNE2), A2 (CCNA2), B1 (CCNB1), and B2 (CCNB2), all regulators of the G1-S, S, and G2-M phase transitions, were expressed in both of these subsets. This was also true for other components involved in cell cycle progression, such as CDK4, CDK2, CDC2, and the E2F family of transcription factors (E2F1–3) (11). Furthermore, the inhibitors of CDK2, p21Cip (CDKN1A) and p27Kip (CDKN1B), were effectively down-regulated, and among the inhibitors of CDK4 class of proteins (INK4) only p18 (CDKN2C) displayed an increased expression in the GC B cell subsets. The members of the polycomb group of genes, ENX and EED, involved in proliferation (12) were also highly up-regulated in the GC B subsets, whereas BMI1 was equally significantly down-regulated (Fig. 4⇑C) in both subsets (13). This transcriptional profile of the cell cycle regulators was shown to correspond to the actual cell cycle status of both the GC B cell subsets. Cell cycle analysis by flow cytometry of the sorted populations demonstrated that both the CD77+ cells as well as the CD77− cells are actively cycling, whereas CD38− naive and memory cells are residing in G0/G1 (Fig. 5⇓A and data not shown). Collectively, these data do not support the traditional conception that centroblasts are CD77+ and centrocytes are CD77−. A, Cell cycle analysis of sorted CD38+/IgD−/CD77+, CD38+/IgD−/CD77−, and CD38−/IgD− (memory) populations. The diagrams represent 50,000 analyzed cells, assessed using three different anti-CD77 Ab clones: 38.13, 5B5, 6A2. The cell cycle analysis substantiates the expression data, demonstrating that both CD38+/IgD−/CD77+ and CD38+/IgD−/CD77− are actively cycling and proliferating. B, Transcript levels of A4GALT (textured) and B3GALT3 (striped) across the following: 1, IgD+/CD23−/CD38−/CD3−; 2, IgD+/CD23+/CD38−/CD3−; 3, IgD−/CD38+/CD77+/CD3−; 4, IgD−/CD38+/CD77−/CD3−; and 5, IgD−/CD38−/CD3− sorted populations. 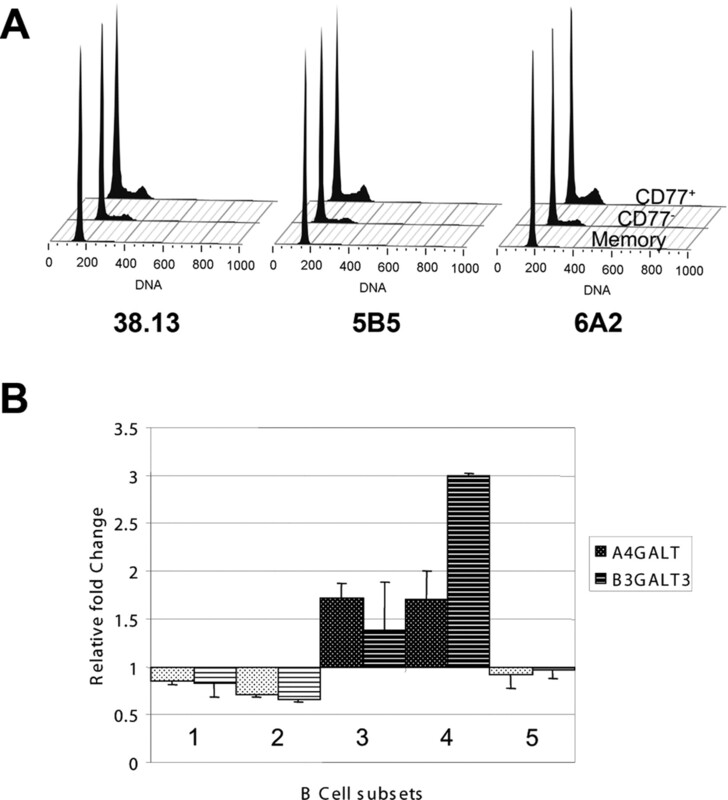 The transcriptional analysis demonstrated that in contrast to A4GALT, involved in the conversion of lactacylcermide to CD77, the B3GALT3, implicated in the successive conversion of CD77 to P Ag, displayed a several fold differential expression between the CD77+ and the CD77− population. The high proliferation rate within the GC jeopardizes the genome integrity of the proliferating centroblast and will, thus, require active DNA-damage and replication checkpoint systems (14). We therefore looked into whether the regulation of components in these systems gives any clue to the nature of the two GC B cell populations. Although the sensor kinases ATM and ATR showed no indication of being induced in either of the GC B cell subsets, several members of the initial damage recognition system, such as RAD17, RFC2-5, and RAD1, and most of the downstream effectors of ATM and ATR, such as Chk1 (CHEK1), Chk2 (CHEK2), and BRCA1, were up-regulated in both the CD77+ and CD77− populations (Fig. 4⇑D). This was also true for the respective Chk1 and Chk2 targets CDC25C and CDC25A. Notable was that p53 (TP53), another target of ATM, displayed a baseline expression pattern across all B cell subsets. However, it was apparent that the p53 activity was functionally restricted in the two GC B cell subsets. This was evident as suggested by the absence of typical p53 targets, such as BID, NOXA (PMAIP1), PUMA (BBC3), APAF1, and p21Cip (CDKN1A), as well as the lack of transcriptional repression from p53 of the antiapoptotic and prosurvival proteins survivin (BIRC5) and strathmin (STMN1). Interestingly, a recent study demonstrated that this restriction may be mediated by a direct repression of the p53 gene transcription by BCL6 (15). This, however, is not supported by our data, as suggested by the detection calls in the Affymetrix MAS 5.0, which still indicate a presence of p53 transcript in all B cell subsets, also reported by others (16). The p53 restriction within the GC may, however, be explained by the presence of selective inhibitors of p53, such as MDM2 and GTSE1, which are up-regulated in the two GC B cell subsets (Fig. 4⇑D). These inhibitors affect both the trans-activating functions as well as the protein level of p53 (17, 18). Centroblasts and centrocytes have earlier been suggested to be functionally separated based on their ability to carry out SHM and CSR, respectively (2, 3). To characterize the two GC B cell subsets from a functional perspective, we then looked more carefully into the transcriptional regulation of components implicated in these processes. This included members of base excision repair (BER), mismatch repair (MMR), homologous recombination (HR), and error-prone translesion DNA polymerases (19, 20) or nonhomologous end joining and nucleotide excision repair implied in CSR (21, 22). Thus, as can be expected for replicating cells, many HR components were induced in the CD77+ population, but to a similar degree also in the CD77− population (Fig. 6⇓A). This transcriptional regulation was seen also among components participating in MMR, such as the MutS homologue 2 (MSH2), MutS homologue 6 (MSH6), and EXO1 (Fig. 6⇓C), as well as for the BER enzyme UNG (Fig. 6⇓D), which is noteworthy considering the specific implication of these particular MMR and BER members in SHM (19). Interestingly, another group of BER enzymes displaying an induced expression in both GC B cell subsets included OGG1, HFPG1 (NEIL1), and HFPG2 (NEIL3). These enzymes are involved in the excision of mutagenic 7,8-dihydro-8-oxoguanine formed or incorporated in the DNA during replication. The presence of these enzymes was substantiated also by the induced 8-oxo-dGTPase MTH1 (NUDT1) (23), which clears 7,8-dihydro-8-oxoguanine from the nucleotide pool (Fig. 6⇓D). 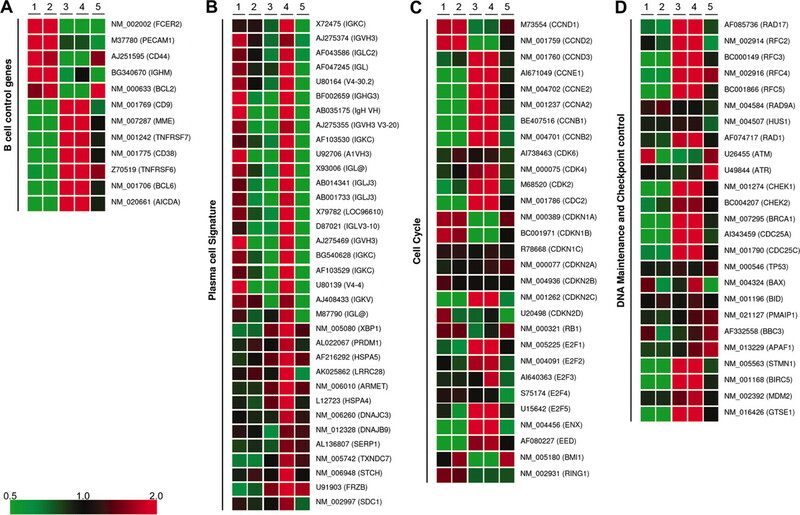 Heat map representation of expression measures for functional groups associated with DNA repair across the following: 1, IgD+/CD23−/CD38−/CD3−; 2, IgD+/CD23+/CD38−/CD3−; 3, IgD−/CD38+/CD77+/CD3−; 4, IgD−/CD38+/CD77−/CD3−; and 5, IgD−/CD38−/CD3− sorted populations. The functional groups present: homologous recombination repair (A), DNA polymerase (B), mismatch repair (C), base excision repair (D), short and long patch repair (E), nucleotide excision repair (F), and non-homologous end joining (G). Color range from >2-fold up-regulated (red) to >2-fold down-regulated (green) expression relative to the mean relative intensity for each gene. Genes are ordered based on a functional relationship within each group. The successive stage of BER involves either a short or a long patch repair of the single strand break generated by the base excision, a step that also may include error-prone translesion DNA polymerases (19). In our analysis, the long patch repair pathway, represented by DNA polymerase δ (POLD1 and POLD3), DNA polymerase ε (POLE and POLE2), proliferating cell nuclear Ag (PCNA), flap endonuclease 1 (FEN1), and DNA ligase I (LIG1), showed a considerable induction in both the GC B cell subsets (Fig. 6⇑E). The short patch repair pathway, in contrast, was neither induced nor repressed (Fig. 6⇑E) and, thus, not indicating any specific linkage to SHM. Interestingly, this was also the case for other factors that have been implicated in SHM, namely the error-prone Y family of DNA polymerases, including Pol ζ (REV3L) (24), Pol η (POLH) (25), and Pol ι (POLI) (26), which all displayed no association to the GC B cell subsets (Fig. 6⇑B). In fact, apart from the major replicative B family polymerases, the only polymerase that showed any induced expression in the GC B cell subsets was the A family member, polymerase θ (POLQ) (Fig. 6⇑B), which is interesting with reference to the recent association of polymerase θ to SHM (27, 28). As for the regulation of the repair pathways implicated in CSR, the nonhomologous end joining members H2AX (H2AFX) and DNA-PKcs (PRKDC) (14) together with XRCC4 demonstrated an activation-induced expression seen in both GC B cell subsets (Fig. 6⇑G), and the only members of the nucleotide excision repair pathway that changed were the DDB2, which increased, and the XPG (ERCC5), which surprisingly decreased in the GC subsets (Fig. 6⇑E). Noteworthy was that the H2AX (H2AFX), a component vital in suppressing translocations and tumor formation (29, 30), was up to 5-fold up-regulated (Fig. 6⇑G). Together, this demonstrates the need for active HR, MMR, and BER programs not only in the CD77+, but also in the CD77− population, further validating that these events are present in both GC subpopulations. Although the majority of the functionally associated transcripts do not differ between CD77+ and CD77− populations, several differences did become apparent. At first, the expressional regulation of the CD77 synthase (A14GALT) between the two GC B cell subsets did not offer any explanation to the differential display of the glycosphingolipid CD77 (Fig. 5⇑B), as it is equally expressed in both CD77+ and CD77− cells. However, looking into the regulation of other members in the globoside metabolic pathway (〈www.genome.jp/kegg/pathway/map/map00603.html〉) revealed that the differential display of CD77 (i.e., globotriaocylceramide: Gb3/Pk bloodgroup Ag) is likely to be mediated by a differential regulation of the enzyme downstream of the CD77 synthase. The transcript of the downstream enzyme, P synthase (B3GALT3), was in fact >2-fold up-regulated in the CD77− population as compared with the CD77+ population (Fig. 4⇑A), which is indicating that the display of CD77 is reflecting a transition stage, to become P Ag positive. Consequently, we also analyzed the presence of the P Ag (i.e., globoside: Gb4) by flow cytometry, and it was clear that P Ag is displayed on a majority of the CD38+ B cells (Fig. 7⇓A). In fact, the P Ag is displayed on a greater number of the CD38+ cells than CD77 is, and it further appears that CD77 and the P Ag can be displayed on the same cell (data not shown), indicating that the 2-fold expression of the P synthase in the CD77− cells reflects a fully developed ability to convert CD77 to P Ag. Although the P Ag is present on a majority of the CD38+ cells, a fraction is still negative for the P Ag (depicted as yellow in Fig. 7⇓A). The implication of this is that the P Ag may constitute a specific GC B cell marker, distinguishing CD38+ GC B cells from CD38+ non-GC B cells, i.e., the P Ag-negative cells. A, Three-dimensional dot plot of P Ag, CD38, and IgD displaying naive cells (IgD+/CD38−/P Ag−) in red, GC cells (IgD−/CD38+/P Ag+) in blue, memory cells (IgD−/CD38−/P Ag−) in orange, plasma blasts (IgD−/CD38+/P Ag−) in yellow, and plasma cells (IgD−/CD382+/P Ag−) in purple. Flow cytometric analysis of the presence of surface P Ag revealed that this marker discriminates a large and distinctive subset of cells from the CD38+ population (blue). B, Morphologic analysis of May-Grunwald/Giemsa-stained cytospin preparations of sorted IgD+/CD38−/CD3− cells (naive, upper right), IgD−/CD38+/CD77+/CD3− cells (CD77+, lower right), and IgD−/CD38+/CD77−/CD3− cells (CD77−, left) at ×100 magnification. All cells are at scale. The morphological analysis revealed that the CD77+ population consists of large and small cells with decondensed chromatin. The CD77− population had a similar content of small and large cells (lower left), but did also contain cells with a plasmacytoid appearance (upper left). The expressional analysis of Ig genes revealed a clear-cut regulatory diversion between the CD77+ and the CD77− populations. Within the CD77+ cells, the Ig gene expression was typically low, whereas the CD77− cells had a significantly up-regulated Ig gene expression (Fig. 4⇑B). Interestingly, concomitant with the Ig gene expression, the plasma cell-specific XBP1 (31, 32) was shown to be up-regulated in the CD77− subset (Fig. 4⇑B). This was also true for the plasma cell-specific Blimp1 (PRDM1), as well as several members of the unfolded protein response, such as GRP78 (HSPA5), GRP94 (TRA1) (33), ARMET, HSP70 (HSPA4), p58 (DNAJC3), ERdj4 (DNAJB9), RAMP4 (SERP1), P5 (34), and two other transcripts previously reported in tonsillar plasma cells, STHC and FRZB (35) (Fig. 4⇑B). To further validate our finding, we sorted naive, CD77+, and CD77− cells and analyzed the general morphology of these cells in each population. This analysis revealed that the CD77+ population contained both large and small lymphocytes, with a typical decondensed chromatin structure, as compared with naive cells (Fig. 7⇑B). Thus, this population contains cells actively involved in recombination and transcription, in which the difference in size reflects the DNA content. The CD77− population had the same cellular composition of both small and large cells having decondensed chromatin. However, in addition, this population also contained cells with a plasmacytoid appearance (Fig. 7⇑B). Taken together, this morphological analysis is supporting the findings, from both the transcriptional analysis as well as the cell cycle analysis, in that both the CD77+ as well as the CD77− populations contain actively cycling cells. Furthermore, the CD77− population contains cells with an already initiated plasma cell differentiation program. A prevailing concept has for many years been that the human GC can be subdivided based on the presence of the glycosphingolipid CD77. The generally accepted view of the GC and its functional contributors has lately been challenged (36), and it has been questioned whether the unique GC functionalities can be spatially separated in a dark and light zone, as suggested. In this study, we have looked into the transcriptional regulation of the five mature human B cell subsets, defined by Liu et al. (1, 2, 3), with a special focus on the GC B cell subsets. Our analysis demonstrates that a profound change occurs in the transcriptional program as the B cell enters the GC (see Fig. 3⇑B), which is the point in which the cells start to rapidly proliferate, expand, and go through a process of affinity maturation. These events are manifested in the transcriptional program of the GC B cells and are unexpectedly shared between both the CD77+ and the CD77− populations, previously suggested to be the centroblasts and centrocytes, respectively. Flow cytometric analysis of DNA content, as well as the transcriptional regulation of cell cycle mediators, demonstrates that both these populations are highly proliferative and that the mitotic program activates several other systems required for a correct passage through the cell cycle. This is evident by the induced expression of factors participating in DNA maintenance checkpoints and DNA repair. Apart from the defined plasma cell program seen in the CD77− population, very small differences are disclosed in the transcriptional regulation between the proposed centroblast population and the centrocyte population. Both populations show an equivalent proliferation status, and components involved in DNA maintenance checkpoints and repair are present at similar transcript levels. Furthermore, components coupled to SHM and CSR reveal no functional difference between the two subsets. The basis for the definition of the centroblast as CD77+ is derived from the observation of CD77+ cells in the GC dark zone, referring to stained tissue sections (1, 9). If correlating this tissue-staining pattern to the traditional GC definition by Hanna (37), who stated that most lymphoid cells in the light zone of the GC are slowly proliferating derivatives from the actively cycling precursors in the dark zone, it could suggest that all GC B cells lacking CD77 are nonproliferating light zone centrocytes. On the basis of this categorization, it was suggested that CSR occurs after the onset of SHM (3), because both CD77+ as well as the CD77− cells had accumulated a large number of somatic mutations (2). However, SHM has never yet been demonstrated to exclusively occur in the CD77+ population despite several characterizations of this population (2, 3, 5, 38). This indicates that a functional dichotomy coupled to the CD77 display cannot be made, and that CD77+ cells are not, necessarily, the only cells to participate in SHM or to make up the GC dark zone. In fact, both subsets may participate in the SHM and CSR programs, because they are both expressing AID, UNG, and several other transcripts related to these processes. Two other findings in support of our conclusion are as follows: first, the observations that both CD77+ and CD77− cells are actively cycling; second, the observation that both these populations express ENX and EED, and lack BMI-1. The polycomb genes ENX and EED have, in tissue sections, been demonstrated to separate typical dark zone centroblasts from the light zone centrocytes, which, in contrast are BMI-1 positive (13). This separation between the centroblast, as ENX and EED positive, and centrocytes, as BMI-1 positive, is not seen in our analysis. 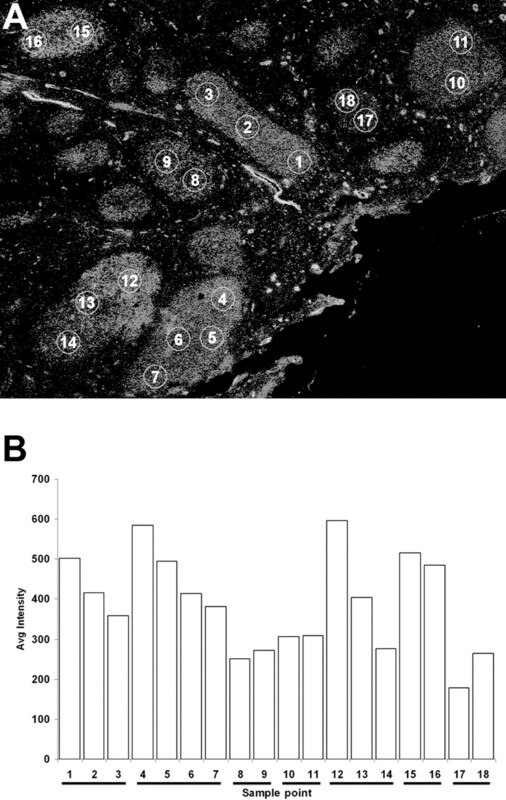 Thus, to separate dark zone centroblasts and light zone centrocytes, other markers are needed, and in this respect, the distinctive staining pattern with anti-P Abs needs to be further elucidated. In summary, we have in this study, based on microarray data and flow cytometry, revealed that CD77+ and CD77− cells lack transcription programs that can be associated with functional characteristics of centroblasts and centrocytes. Furthermore, we found that both populations are actively cycling, which is a description not fitting with the accepted definitions of centrocytes. 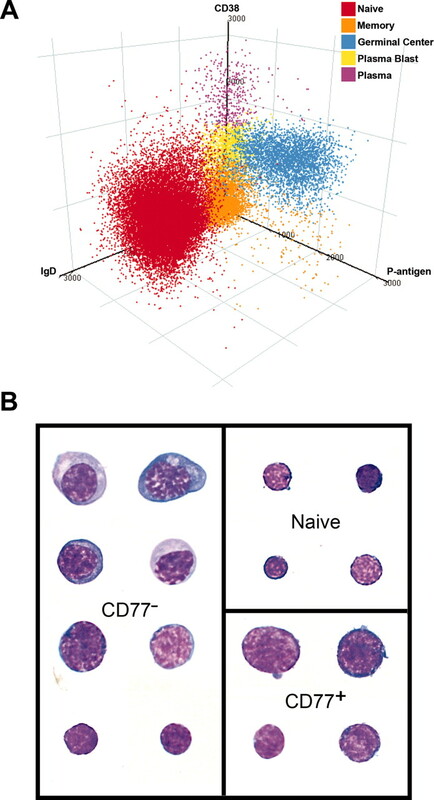 The CD77− population also contains cells with an already initiated plasma cell differentiation program, and finally, we demonstrated that P Ag constitutes a GC-specific B cell marker. Based on this, we conclude that CD77 is not a reliable marker discriminating centroblasts and centrocytes, and further that the CD38+CD77− population is heterogeneous, comprising several different cells ranging from proliferating centroblasts to Ig-producing plasma blasts. We thank Ann-Charlotte Olsson for expert technical assistance; Dr. Martin L. Olsson (Division of Hematology and Transfusion Medicine, Lund University, Lund, Sweden) for helpful discussions on the P Ag; and Ingbritt Åstrand-Grundström (Hemopoietic Stem Cell Laboratory, Lund University) for assistance with the morphological evaluations. ↵1 This study was supported by the Faculty of Technology, Lund University, and in part supported by a Translational Research Grant from The Leukemia & Lymphoma Society (Contract 6085-06). ↵3 Abbreviations used in this paper: GC, germinal center; SHM, somatic hypermutation; CSR, class switch recombination; AID, activation-induced cytidine deaminase; UNG, uracil-DNA glycosylase; BCL, B cell line; BER, base excision repair; MMR, mismatch repair; HR, homologous recombination. Liu, Y. J., O. de Bouteiller, C. Arpin, I. Durand, J. Banchereau. 1994. Five human mature B cell subsets. Adv. Exp. Med. Biol. 355: 289-296. Pascual, V., Y. J. Liu, A. Magalski, O. de Bouteiller, J. Banchereau, J. D. Capra. 1994. Analysis of somatic mutation in five B cell subsets of human tonsil. J. Exp. Med. 180: 329-339. Ek, S., C. M. Hogerkorp, M. Dictor, M. Ehinger, C. A. Borrebaeck. 2002. Mantle cell lymphomas express a distinct genetic signature affecting lymphocyte trafficking and growth regulation as compared with subpopulations of normal human B cells. Cancer Res. 62: 4398-4405. Klein, U., Y. Tu, G. A. Stolovitzky, J. L. Keller, J. Haddad, Jr, V. Miljkovic, G. Cattoretti, A. Califano, R. Dalla-Favera. 2003. Transcriptional analysis of the B cell germinal center reaction. Proc. Natl. Acad. Sci. USA 100: 2639-2644. Bolstad, B. M., R. A. Irizarry, M. Astrand, T. P. Speed. 2003. A comparison of normalization methods for high density oligonucleotide array data based on variance and bias. Bioinformatics 19: 185-193. Irizarry, R. A., B. Hobbs, F. Collin, Y. D. Beazer-Barclay, K. J. Antonellis, U. Scherf, T. P. Speed. 2003. 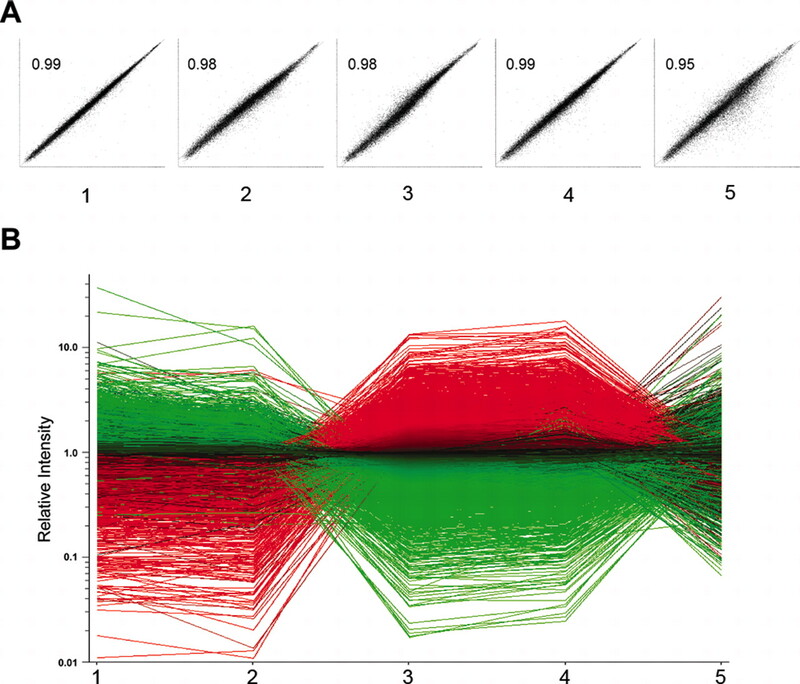 Exploration, normalization, and summaries of high density oligonucleotide array probe level data. Biostatistics 4: 249-264. Fyfe, G., J. A. Cebra-Thomas, E. Mustain, J. M. Davie, C. D. Alley, M. H. Nahm. 1987. Subpopulations of B lymphocytes in germinal centers. J. Immunol. 139: 2187-2194. Ling, N. R., D. Hardie, J. Lowe, G. D. Johnson, M. Khan, I. C. MacLennan. 1989. A phenotypic study of cells from Burkitt lymphoma and EBV-B-lymphoblastoid lines and their relationship to cells in normal lymphoid tissues. Int. J. Cancer 43: 112-118. Schwartz-Albiez, R., B. Dorken, P. Moller, N. T. Brodin, D. A. Monner, B. Kniep. 1990. Neutral glycosphingolipids of the globo-series characterize activation stages corresponding to germinal center B cells. Int. Immunol. 2: 929-936. Trimarchi, J. M., J. A. Lees. 2002. Sibling rivalry in the E2F family. Nat. Rev. Mol. Cell Biol. 3: 11-20. Jacobs, J. J., M. van Lohuizen. 2002. Polycomb repression: from cellular memory to cellular proliferation and cancer. Biochim. Biophys. Acta 1602: 151-161. Raaphorst, F. M., F. J. van Kemenade, E. Fieret, K. M. Hamer, D. P. Satijn, A. P. Otte, C. J. Meijer. 2000. 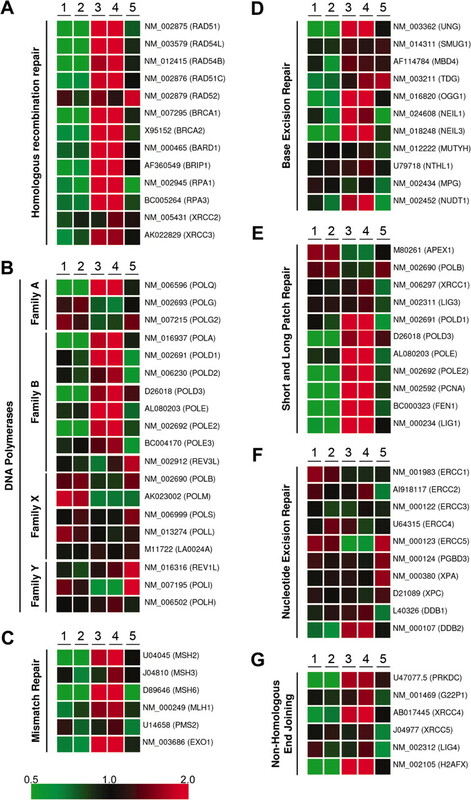 Cutting edge: polycomb gene expression patterns reflect distinct B cell differentiation stages in human germinal centers. J. Immunol. 164: 1-4. Hoeijmakers, J. H.. 2001. Genome maintenance mechanisms for preventing cancer. Nature 411: 366-374. Phan, R. T., R. Dalla-Favera. 2004. The BCL6 proto-oncogene suppresses p53 expression in germinal-centre B cells. Nature 432: 635-639. Martinez-Valdez, H., C. Guret, O. de Bouteiller, I. Fugier, J. Banchereau, Y. J. Liu. 1996. Human germinal center B cells express the apoptosis-inducing genes Fas, c-myc, P53, and Bax but not the survival gene bcl-2. J. Exp. Med. 183: 971-977. Meek, D. W.. 2004. The p53 response to DNA damage. DNA Repair 3: 1049-1056. Monte, M., R. Benetti, G. Buscemi, P. Sandy, G. Del Sal, C. Schneider. 2003. The cell cycle-regulated protein human GTSE-1 controls DNA damage-induced apoptosis by affecting p53 function. J. Biol. Chem. 278: 30356-30364. Petersen-Mahrt, S. K., R. S. Harris, M. S. Neuberger. 2002. AID mutates E. coli suggesting a DNA deamination mechanism for antibody diversification. Nature 418: 99-103. Zan, H., X. Wu, A. Komori, W. K. Holloman, P. Casali. 2003. AID-dependent generation of resected double-strand DNA breaks and recruitment of Rad52/Rad51 in somatic hypermutation. Immunity 18: 727-738. Manis, J. P., D. Dudley, L. Kaylor, F. W. Alt. 2002. IgH class switch recombination to IgG1 in DNA-PKcs-deficient B cells. Immunity 16: 607-617. Wu, X., P. Geraldes, J. L. Platt, M. Cascalho. 2005. The double-edged sword of activation-induced cytidine deaminase. J. Immunol. 174: 934-941. Meyer, F., E. Fiala, J. Westendorf. 2000. Induction of 8-oxo-dGTPase activity in human lymphoid cells and normal fibroblasts by oxidative stress. Toxicology 146: 83-92. Zan, H., A. Komori, Z. Li, A. Cerutti, A. Schaffer, M. F. Flajnik, M. Diaz, P. Casali. 2001. The translesion DNA polymerase ζ plays a major role in Ig and bcl-6 somatic hypermutation. Immunity 14: 643-653. Yavuz, S., A. S. Yavuz, K. H. Kraemer, P. E. Lipsky. 2002. The role of polymerase η in somatic hypermutation determined by analysis of mutations in a patient with xeroderma pigmentosum variant. J. Immunol. 169: 3825-3830. Faili, A., S. Aoufouchi, E. Flatter, Q. Gueranger, C. A. Reynaud, J. C. Weill. 2002. Induction of somatic hypermutation in immunoglobulin genes is dependent on DNA polymerase ι. Nature 419: 944-947. Zan, H., N. Shima, Z. Xu, A. Al-Qahtani, A. J. Evinger, Iii, Y. Zhong, J. C. Schimenti, P. Casali. 2005. The translesion DNA polymerase θ plays a dominant role in immunoglobulin gene somatic hypermutation. EMBO J. 24: 3757-3769. Masuda, K., R. Ouchida, A. Takeuchi, T. Saito, H. Koseki, K. Kawamura, M. Tagawa, T. Tokuhisa, T. Azuma, and J. O.-Wang. 2005. DNA polymerase θ contributes to the generation of C/G mutations during somatic hypermutation of Ig genes. Proc. Natl. Acad. Sci. USA 102: 13986–13991. Bassing, C. H., H. Suh, D. O. Ferguson, K. F. Chua, J. Manis, M. Eckersdorff, M. Gleason, R. Bronson, C. Lee, F. W. Alt. 2003. Histone H2AX: a dosage-dependent suppressor of oncogenic translocations and tumors. Cell 114: 359-370. Celeste, A., O. Fernandez-Capetillo, M. J. Kruhlak, D. R. Pilch, D. W. Staudt, A. Lee, R. F. Bonner, W. M. Bonner, A. Nussenzweig. 2003. Histone H2AX phosphorylation is dispensable for the initial recognition of DNA breaks. Nat. Cell Biol. 5: 675-679. Reimold, A. M., N. N. Iwakoshi, J. Manis, P. Vallabhajosyula, E. Szomolanyi-Tsuda, E. M. Gravallese, D. Friend, M. J. Grusby, F. Alt, L. H. Glimcher. 2001. Plasma cell differentiation requires the transcription factor XBP-1. Nature 412: 300-307. Iwakoshi, N. N., A. H. Lee, P. Vallabhajosyula, K. L. Otipoby, K. Rajewsky, L. H. Glimcher. 2003. Plasma cell differentiation and the unfolded protein response intersect at the transcription factor XBP-1. Nat. Immunol. 4: 321-329. Gass, J. N., N. M. Gifford, J. W. Brewer. 2002. Activation of an unfolded protein response during differentiation of antibody-secreting B cells. J. Biol. Chem. 277: 49047-49054. Lee, A. H., N. N. Iwakoshi, L. H. Glimcher. 2003. XBP-1 regulates a subset of endoplasmic reticulum resident chaperone genes in the unfolded protein response. Mol. Cell. Biol. 23: 7448-7459. Zhan, F., E. Tian, K. Bumm, R. Smith, B. Barlogie, J. Shaughnessy, Jr. 2003. Gene expression profiling of human plasma cell differentiation and classification of multiple myeloma based on similarities to distinct stages of late-stage B-cell development. Blood 101: 1128-1140. Manser, T.. 2004. Textbook germinal centers?. J. Immunol. 172: 3369-3375. Hanna, M. G., Jr. 1964. An autoradiographic study of the germinal center in spleen white pulp during early intervals of the immune response. Lab. Invest. 13: 95-104. Alizadeh, A. A., M. B. Eisen, R. E. Davis, C. Ma, I. S. Lossos, A. Rosenwald, J. C. Boldrick, H. Sabet, T. Tran, X. Yu, et al 2000. Distinct types of diffuse large B-cell lymphoma identified by gene expression profiling. Nature 403: 503-511.